Merlins of Wakefield held their 21st Birthday Celebration day on Sunday 15th May at Unity Works in Wakefield. The day started with Phil Peters and Mark Lee thanking everyone for attending and outlining the days events. A ‘goody’ bag was provided to every day registrant containing a programme, deck of bicycle cards, pen, key ring, magic DVD, magic trick and other goodies which was well appreciated by all. The first lecture was by Lawrence Turner on ‘Roughing Decks’ and effects using the principle. 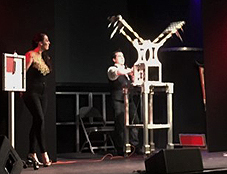 During the day there was also Professor Jon with his amazing Flea Circus and a great lecture by Darren Mac. 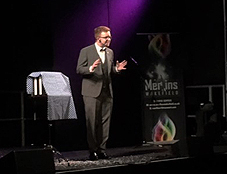 Former members of Merlins Magic Academy Craig Roe, Kev Mark, Darren Mac and Charles Creasey all performed stand-up magic to an enthralled audience. The dealers also reported a busy dealer room, and seamed very happy with the day. In the evening, the Gala Show consisted of Thomas Anthony, Ali Cardabra, Michael Jordan, Amethyst, Destiny, Darren Mac and High Jinx. 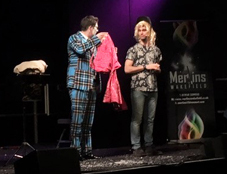 The show was compered by the talented Daren Mac who kept the proceedings running smoothly. Overall opinion was that for it had been an excellent day of magic and variety. A big thanks to everyone concerned who helped or took part in the day and the staff at The Unity Works, who all made the day a great success.